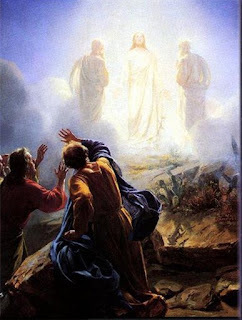 [On the Mount of Transfiguration ...] they saw Christ in glory at a moment when His total surrender to the will of the Father, His final and ultimate acceptance of His own human destiny, became revealed to them. Moses and Elijah, we are told, stood by Him; the one representing the Law and the other one representing the Prophets: both have proclaimed the time when salvation would come, when the Man of suffering will take upon Himself all the burdens of the world, when the Lamb of God slain before all ages would take upon Himself all the tragedy of this world. It was a moment when in His humanity Christ, in humble and triumphant surrender, gave Himself ultimately to the Cross. Last week we heard Him say that the Son of God will be delivered in the hand of men, and they will crucify Him, but on the third day He will rise. At that moment it became imminent, it was a decisive point, and He shone with the glory of the perfect, sacrificial, crucified love of the Holy Trinity, and the responsive love of Jesus the Man, as Saint Paul calls Him. The Apostles saw the shining, they saw the divine light streaming through the transparent flesh of Christ, falling on all the things around Him, touching rock and plant, and calling out of them a response of light. They alone did not understand, because in all the created world man alone has sinned and became blind. And yet, they were shown the mystery, and yet, they entered into that cloud which is the divine glory, that filled them with awe, with fear, but at the same time with such exulting joy and wonder! Moses had entered that cloud and was allowed to speak to God as a friend speaks to a friend; he was allowed to see God passing by him, still without a name, still without a face; and now, they saw the face of God in the Incarnation. They saw His face and they saw His glory shining out of tragedy. What they perceived was the glory, what they perceived was the wonder of being there, in the glory of God, in the presence of Christ revealed to them in glory. They wanted to stay there forever, as we do at moments when something fills us with adoration, with worship, with awe, with unutterable joy, but Christ had told them that the time has come to go down into the valley, to leave the Mount of Transfiguration because this was the beginning of the way of the Cross, and He had to be merged into all that was tragic in human life. He brought them down into the valley to be confronted with the agony of the father whose child could not be cured, with the inability of the disciples to do anything for this child, with the expectation of the people who now could turn to no-one but Him - that is where He brought them. And we are told that He had chosen these three disciples because together, in their togetherness they held the three great virtues that make us capable of sharing with God the mystery of His incarnation, of His Divinity, of His crucifixion, to face His descent into hell after His death and to receive the news of His resurrection: the faith of Peter, the love of John, the righteousness of James. There are moments when we also see something which is beyond us, and how much we wish we could stay, stay forever in this blissful condition; and it is not only because we are incapable of it that we are not allowed to stay in it, but because the Lord says, You are now on the Mount of Transfiguration, you have seen Christ ready to be crucified for the life of the world - go now together with Him, go now in His name, go now, and bring people to Him that they may live! This is our vocation. May God give us faith, and the purity of heart that allows us to see God in every brother and sister of ours! Didn't one of the Desert Fathers say, ‘He who has seen his brother has seen God’? - and serve one another with love sacrificial, with the exulting joy of giving our lives to one another as Christ gave His life for us. Amen. This is lovely and powerful! It was this time last year that I was preparing to come to Melbourne. I've been thinking of you and all the others I met and sending prayers to the Father! I trust that you are well and that the Holy Spirit and the power of the Blood of Jesus Christ is undertaking on your behalf! Thank you, Alice. Your contribution to the Conference - both your presence and what you shared - was a great blessing to everyone. Keep the prayers going . . . please!